Don’t be a chop! Avoid sunburn! Home » Blog » Don’t be a chop! Avoid sunburn! It is that time of the year when the blazing sun will burn you to a crisp if you don’t take proper precautions. Sun care is something that is easily ignored by most anglers, as greasy, smelly sunscreen doesn’t mix well when handling gear, bait or your catch. Recent research suggests that you are four times more likely than your father to get skin cancer. Certainly not a statement to be taken lightly. South Africa has the second highest skin cancer rates after Australia and at least 80 percent of sun-induced skin damage occurs before the age of 18, according the Cancer Association of South Africa (CANSA). 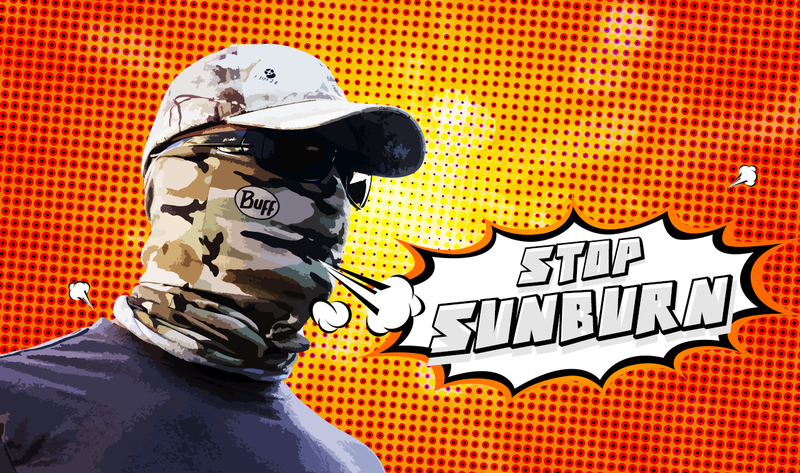 Aside from the obvious solution, applying layers of sunblock until you resemble a melted ice-cream cone, there are ways anglers can up their game in taking proper precautions. Early last year, Mr Price Sport began to stock their shelves with a UV protective clothing range endorsed by CANSA, called Trail Tech. They have breathable long sleeve shirts and other clothing items that offer protection at affordable prices. Another great addition to your wardrobe is a UV Buff Ⓡ. It is readily available in most outdoor stores and are versatile in the way you can wear it. Also check that your polarized sunglasses have a protection rating of UV400. Oh, and don’t forget your hat on your next trip! It’s always a good idea to keep a spare cap in the car, just in case. Sounds confusing? The sun, in moderation, aids the body in the production of Vitamin D which increases the skin’s tolerance to the sun. Nature works in mysterious ways doesn’t it? Very few foods naturally contain Vitamin D, and the lack thereof can lead to a variety of health issues including increased risk of common cancers, autoimmune diseases, hypertension and infectious diseases. So before you slap on layer upon layer of sunscreen, expose yourself to some sun for a few minutes during the early or late hours of the day (when the sun’s rays are less direct). The Sun Protection Factor (SPF) number on sunblock is a measure of how well it protects your skin against UV rays. If it takes your unprotected skin about 7 to 10 minutes before turning red, then using an SPF 30 sunscreen theoretically prevents reddening 30 times longer – about 3½ to 5 hours on average. If it takes 3 to 4 minutes for reddening to occur, then you will be protected with SPF 30 sunscreen for 1½ to 2 hours on average. For those with fair skin, you will have to apply sunscreen more often. When you purchase sunscreen, make sure it carries the CANSA endorsement, and it protects against both UVA and UVB rays. UV radiation can be monitored by wearing a UV Smart armband that turns darker in colour as UV radiation intensifies. The different shades provide recommendations you can follow in order to prevent sunburn. This nifty product is only R30, and is available at CANSA Care Centres nationwide. Disclaimer: The information provided is for informative purposes only. Always seek help from a medical professional.